I am selling my 2001 Porsche Boxster S in Arctic Silver Metallic with a Graphite Gray top. It currently has 116,252 miles on it. The bad news is it has developed the P1341 code that resolves to the camshaft adjustment, bank 1 being below limit. Typically this means the bank 1 variocam solenoid needs to be replaced. The good news is that within the past year it has had new rear tires, brake rotors, a top replacement, and a battery replacement. The top was replaced at 109,005 miles and the car is garaged except for at work but it is not a daily driver for me. All this along with an aftermarket headunit, 100W amplifier, and a set of component speakers installed. This car has been in my family since 9/26/2009 when it had 53741 miles. I have a spreadsheet and most records dating back to that time when my father purchased it. These records document the replacement of the water pump, AOS and oil filler tube, and all O2 sensors. It currently has the Rest of the World M030 suspension on it, a 997 shift linkage, as well as the Porsche Motorsports oil baffle. I do have a Brey Krause roll bar extension as well as a set of 987 Cayman S wheels with Toyo R1Rs on them that may be included in the sale. This car has seen track time and autocrosses however it has not been raced. I have attempted to document all of the cosmetic issues with this car to be transparent. Additionally I have Blackstone Oil Analysis results available for those interested. 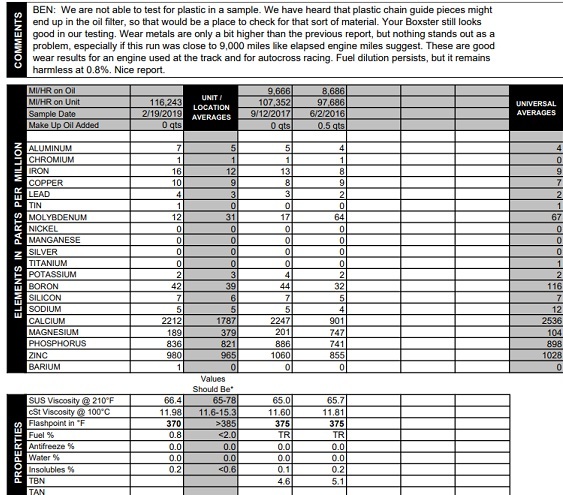 Up until the P1341 code the results have been very good compared to other engines. This leads me to believe that the rest of the engine is healthy. I have spoken to Hendrick Porsche in Charlotte, NC and they quoted me approximately $2,000 for the repair on this engine. I haven't had time to resize them to fit on the board servers. Well I found a 964 so price drop! $8500 or best offer without Cayman S wheels, RS-11, Car Cover, and BK rollbar extension. Also results from Blackstone were good on wear metals. Will post a picture tomorrow.